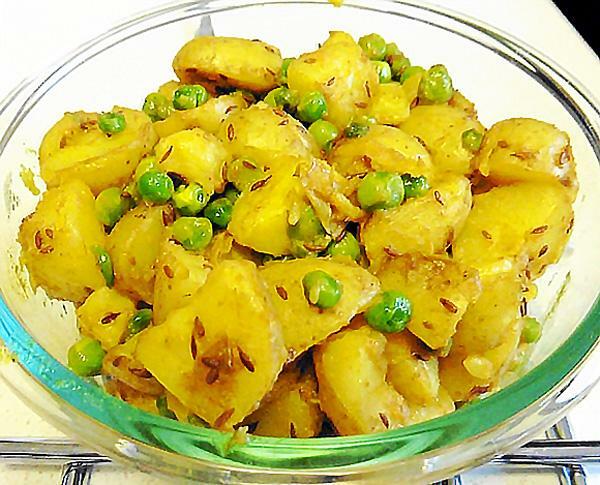 Adding peas to potato bhaji gives it an extra dimension. It is easy and tasty, especially with parathas. In northern India, it is made with a cumin 'tarka', but you can make it with black mustard seed and curry leaves tarka or even a Panch Pooran tarka. It can be made with or without onions. Garlic is usually not added here. 500 gm. new potatoes or large potatoes peeled and chopped into bite size pieces. 1 cup peas. I use frozen peas, but you can use fresh ones. Peel and chop potatoes into small, bite size pieces. Peel and grate or finely chop ginger. Heat oil in a karahi or wok. Add cumin seeds, allow them seeds crackle/splutter. Add ginger, and chopped onion, if used. Fry until onion is medium brown. Add potatoes and peas, if using raw peas. Add all ground spices. Give a quick stir to coat vegetables. Cook covered on low heat, until potatoes are nearly cooked. You may need to add a sprinkle of water, but if you keep the heat low, it is usually not required. If using frozen peas, add now and stir them in. Let them cook on low hear for 5 minutes or so. Adjust seasoning, add amchoor powder or lemon juice and coriander leaves. Add coriander leaves and serve hot with Plain Paratha or Poori or as part of any Indian meal. They also make a good filling for toasted sandwiches.